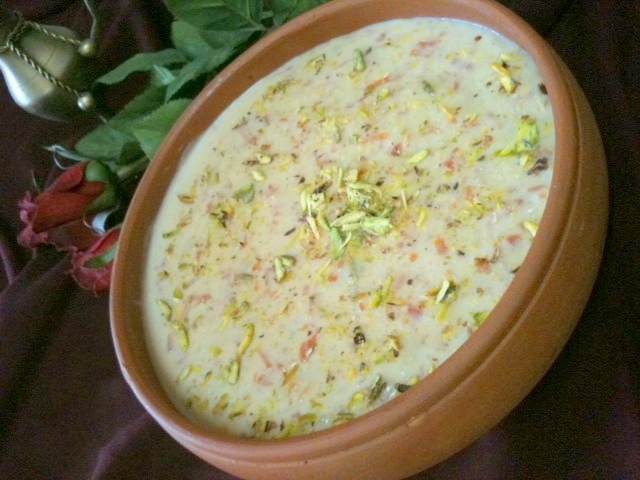 Gajar ki kheer also known as Gajrela is yet another popular sweet dish made in Pakistan. I am sharing with you the exact way how my mother used to make it except the fact that she never added condensed milk, so why not give your taste buds a sweet treat by making this simple, easy yet full of flavors recipe of Gajar ki kheer. Take a heavy bottom pan, add milk and let it come to a boil, once the milk starts to boil turn down the flame to medium-low and let it simmer. Drain the water from rice and crush the rice with your hands, this will break one grain of rice in to 3-4 pieces, now add the rice and grated carrots to the milk and stir for a few minutes, also add the cardamom pods and let it cook on low flame till milk reduces to almost half and rice grains gets soft and mushy (Don’t forget to stir). Once the Milk has reduced to half add ¼ tsp of salt, almonds and ¾ can of sweetened condensed milk and cook till you feel that the kheer has started to get thick and starts to bubble, but don't make it too thick as the kheer tends to thicken a bit while it cools down. Turn off the flame and add 3 drops of kewra essence and nuts (although I personally don’t add nut). Allow it to cool down at room temperature, pure it in to a serving dish, Garnish with slivered almonds and pistachios. Its best to let it chill in fridge for 3-4 hours before serving. Note: please adjust sweetness according to your own taste, if you prefer it to be more sweet add the whole can. Gajrela is gajar ka halwa, not gajar ki kheer.